The Ostroverkhova group’s work on bee vision had attracted a lot of attention! Ostroverkhova et al examined responses of wild bees to traps designed to selectively stimulate either the blue or the green photoreceptor using sunlight-induced fluorescence in the 420-480 nm or 510-540 nm region. Image credit: Rebekka D.
CORVALLIS, Ore. – Researchers at Oregon State University have learned that a specific wavelength range of blue fluorescent light set bees abuzz. 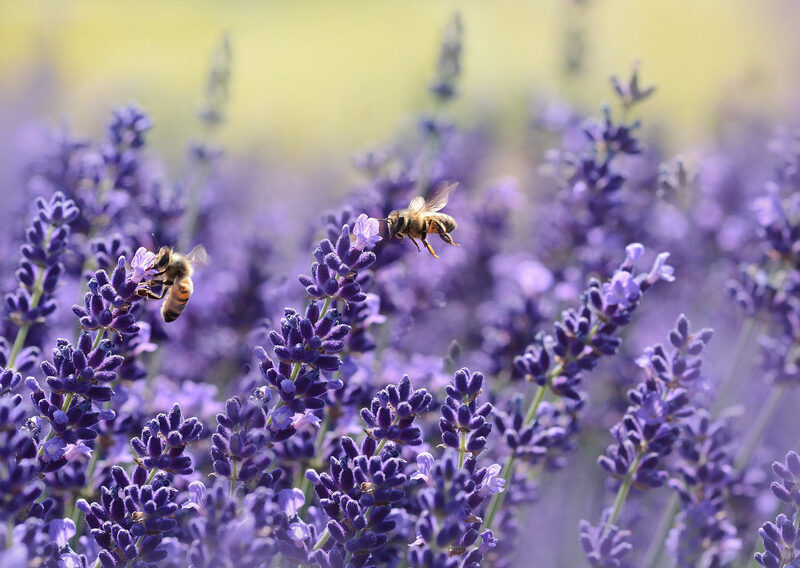 The research is important because bees have a nearly $15 billion dollar impact on the U.S. economy – almost 100 commercial crops would vanish without bees to transfer the pollen grains needed for reproduction. 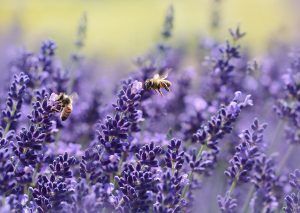 The findings are a powerful tool for assessing and manipulating bee populations – such as, for example, if a farmer needed to attract large numbers of bees for a couple of weeks to get his or her crop pollinated. Fluorescent light is what’s seen when a fluorescent substance absorbs ultraviolet rays or some other type of lower-wavelength radiation and then immediately emits it as higher-wavelength visible light – think about a poster whose ink glows when hit by the UV rays of a blacklight. Like humans, bees have “trichromatic” vision: They have three types of photoreceptors in their eyes. Both people and bees have blue and green receptors, but the third type for people is red while the third kind for bees is ultraviolet – electromagnetic energy of a lower wavelength that’s just outside the range of human vision. Flowers’ vibrant colors and patterns – some of them detectable only with UV sight – are a way of helping pollinators like bees find nectar, a sugar-rich fluid produced by plants. Bees get energy from nectar and protein from pollen, and in the process of seeking food they transfer pollen from a flower’s male anther to its female stigma. Building on her earlier research, Ostroverkhova, a physicist in OSU’s College of Science, set out to determine if green fluorescence, like blue, was attractive to bees. She also wanted to learn whether all wavelengths of blue fluorescence were equally attractive, or if the drawing power tended toward the green or violet edge of the blue range. In field conditions that provided the opportunity to use wild bees of a variety of species – most bee-vision studies have been done in labs and used captive-reared honeybees – Ostroverkhova designed a collection of bee traps – some non-fluorescent, others fluorescent via sunlight – that her entomology collaborators set up in the field. Under varying conditions with a diverse set of landscape background colors, blue fluorescent traps proved the most popular by a landslide. Researchers examined responses to traps designed to selectively stimulate either the blue or the green photoreceptor using sunlight-induced fluorescence with wavelengths of 420 to 480 nanometers and 510 to 540 nanometers, respectively. They found out that selective excitation of the green photoreceptor type was not attractive, in contrast to that of the blue. “And when we selectively highlighted the blue photoreceptor type, we learned the bees preferred blue fluorescence in the 430- to 480-nanometer range over that in the 400-420 region,” Ostroverkhova said. Findings were recently published in the Journal of Comparative Physiology A. The Agricultural Research Foundation and OSU supported this research. Posted in Faculty, Papers, Research, Uncategorized.